Manila, Philippines - The recent launch of financial comparison site MoneyMax.ph paves the way for more Filipinos to get the best value for their money as they make sound long-term financial decisions. The website gives free and easy access to information on local financial products. MoneyMax features a powerful comparison tool designed to make searching for product information, as well as comparing prices and product features, faster and easier. With the help of MoneyMax, consumers can easily choose the best credit card to fit their lifestyle. In partnership with various banks, financial institutions, and service providers, the site also offers visitors the option to compare broadband plans, health and life insurance plan packages, housing loans, and other financial services and products. The financial comparison site is extremely helpful to those researching about credit cards, broadband Internet plans, or insurance policies. 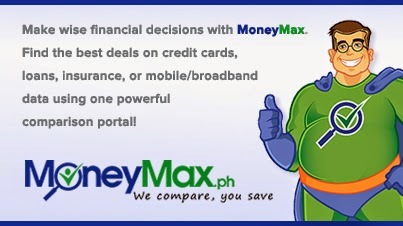 Instead of having to make calls to the banks or visit corporate websites individually to get information, all aspiring loan and credit card applicants have to do is log on to www.moneymax.ph, search for the specific product they are interested in, and then click on the “Compare Now” button to get customised results. The online comparison tool screens out results depending on the criteria the searcher/ user picks. For instance, credit card searchers may use various fields including “Bank” and “Card” type, by selecting from the drop-down button. To narrow down the results, users have the option to indicate whether or not they’re an Existing card holder, choose their Monthly gross income, and specify if they’re a Filipino citizen or a Foreigner. Other filters for credit card comparison include Rewards, Premium, Cashback, Airmiles, Petrol, Shopping. Users may also arrange the results to display the credit card with the best criteria in terms of being the Best Seller, the Annual Fee, or Interest Rate. MoneyMax co-founder and vice-president Quentin Bouche speaks about the site and its relevance to Filipino consumers: “Right now in the Philippines, people primarily select and choose their products based on convenience and trust. The selection they make is often not the best that is available in the market.” He stressed that MoneyMax can provide individuals free access to financial products which can save them time and money in just a few minutes. “We can help people acquire the best product in the most convenient way,” Bouche added. Apart from the free comparison tool it offers, MoneyMax also features in-depth guides, FAQs, news stories, and articles that will help the average Pinoy gain a better understanding of the financial products and services they are interested in, so that they can make better, well-informed decisions. Users who would like to give MoneyMax’s free comparison services a try may do so by going directly to their website.